Felicia and Matthew’s wedding was a day full of celebration, from getting ready all the way to the last song of the night. It was a cold and wet morning in Fort Wayne, Indiana, classic weather for a Midwestern fall, but that didn’t damper anyone’s spirit. The Bride and her Bridesmaids began the day at the home of Paula, the matron of honor, preparing each other’s hair and makeup. There was a lot of laughter in the house that morning from stories, reminiscing, playing with adorable dogs, and excitement for the day ahead. 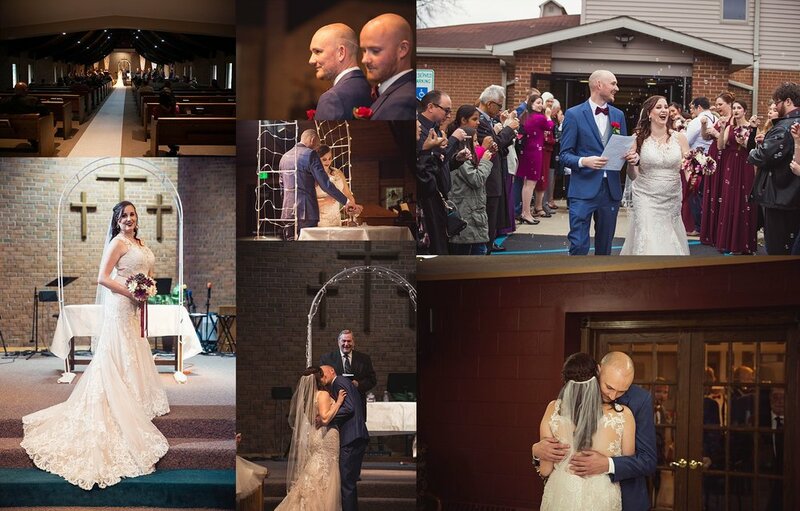 We headed to Trinity Church of the Nazarene and tucked away the bride into the bridal room where she and the bridesmaids could finish getting ready, with the groom and his groomsmen across the hall. Family and Friends gathered in the church common areas shortly afterwards and I loved watching the flower girls and one of the ring bearers dance and play in the hallway. One of my favorite moments from that morning was having the Bride’s mom, Carol, come into the room to finish the last few buttons that cascaded down the back of the gown. As Carol finished putting the final touch of the veil on Felicia, there wasn’t a dry eye in the room including myself. Right before the ceremony began we did a first look in a private room. The look upon Matthew’s face was the best reaction I have seen yet and the two of them held each other, for this moment was all theirs. They exited the room, hand in hand, and proceeded to where everyone was gathered to walk down the aisle. It was a beautiful vow exchange under gorgeously designed arches, and their bridal party of twelve split among each side with a sand unity ceremony and a fun bubble exit. We gathered at Purdue campus for bridal party portraits. I want to give a major shout out to the bride and groom, and their bridal party, because I have never had a more organized session in fifteen minutes. Also, thank you mother nature for holding off on the rain during our time outside. As soon as we arrived at the Firehouse Reception Hall, it was a non-stop party filled with love and amazing dance moves. We got to know more about the bride and groom as multiple bridesmaids and groomsmen told stories about the couple, and I have to say the speech given by Nathan, the best man, had the entire room in uproarious laughter. The first dance song was “From the Ground Up” by Dan and Shay, and you could tell how much the lyrics spoke to Felicia and Matthew. It seemed like in that moment the world fell silent around them, and it was just them again embracing each other but now as man and wife. “I have just started to get to know you (Matthew) but I already know everything I need to. I see the way Felicia looks at you, with eyes full of love. More importantly, though, I see the way you look at her. I see how much you love and adore her. I can see how happy you two make each other. I look forward to so many more years getting to know you, but I am more than happy to welcome you into our little family.